SteelCrest baseboard return air grilles are offered in 32 different patterns. Decorative air vents feature a durable powder coat available 15 in finishes. These baseboard return air grilles are open all the time for constant air flow to your system. 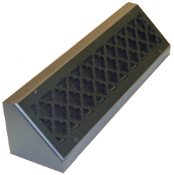 Decorative air vents are crafted of 18 gauge steel and the faceplate is 1/8 of an inch thick. Baseboard return air grilles are available in 8 inch, 12 inch, 18 inch, 24 inch, 30 inch and 36 inch lengths or even custom sizes. These decorative air vents are chip and rust resistant in addition to being a quality American made product. Note: Decorative air vents are considered a special order non returnable item and cannot be canceled once payment is received. They take approximately 5-8 weeks to be made and ship directly from the manufacturer. Rush shipments (2-4 weeks) are available for an additional cost, please call to inquire. Please contact us with any questions relating to these baseboard return vents or color sample requests. Color samples of the finishes options can be mailed to you for a small deposit which is then refunded upon their return. Baseboard return air grilles are just one of the many register and return air grille choices offered by Steel Crest, giving you the option to coordinate your heating and cooling elements for a unique designer look. These decorative air vents are ideal for residential and commercial use and will offer a wow factor wherever you use them, order today! Size 8" 12" 18" 24" 30" 36"